This group grill has 2 separate cooking grates for group gatherings at the park. The grates are adjustable to 4 levels with vandal resistant slots and 1/2" steel bars welded on 1" centers. 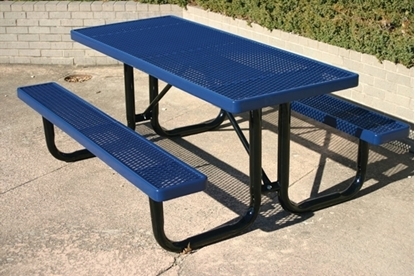 Each grill measures 14" x 36" giving you a total of 1008 sq. in. of cooking surface, providing plenty of space to cook different foods at the same time. This group park grill features a 10 x 28 x 3/16 inch utility shelf that provides a convenient work space for the chef. The fire box is 3/16" thick steel that is 36" W x 28" D x 10" H with a large formed ash lip to reinforce the fire box and help prevent hot coals from falling out. The fire box is strengthened on the bottom with supporting gussets and mounts on a single 6 inch square steel pedestal with a 12 x 12 x 3/8 inch base mounting plate (4 1/2 x 6 inch anchor bolts are furnished.) 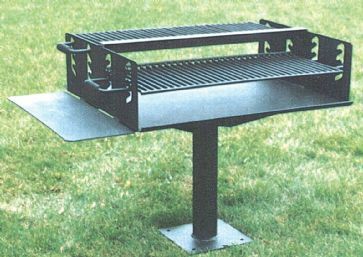 This park grill is finished in non-toxic, heat and rust-resistant black enamel.